I am presently writing my British Association of Counselling and Psychotherapy (BACP) accreditation application form. It is a lengthy process and is a form that needs time and energy. Accreditation is necessary but also a useful process as it enables me to reflect on my practice as a counsellor. However, I am finding it is easier to procrastinate and avoid writing the application form by filling my time with other administration tasks. These activities I keep myself busy with are all important but do not contribute towards my main goal of completing my form. By procrastinating I end up feeling guilty about avoiding it and I am beginning to stress that I will not meet my personal deadline of completion. Does this sound familiar to you? Do you find you avoid doing a task that needs to be done? 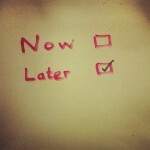 Do you wonder what steps are needed to overcome procrastination? Overcoming procrastinating usually involves both better organisational and time-management skills as well as a clearer understanding of the personal and emotional reasons to why you procrastinate. The organisational and time management skills can be learned and improved with practice. The tips below will help you. It is important to find your own way of working rather than trying to follow someone else’s footsteps or doing something you are not comfortable with. Accept that there is no magic wand: you have to do the task! The words we use to ourselves in thinking or talking about the task matter! Try changing the words ‘have to’ and ‘can’t’ to ‘choose to’ and ‘choose not to’. For example, I don’t have to do my BACP accreditation but I choose to do it. Try to work out why you procrastinate: what do you gain from it? Find out how to overcome such self-defeated behaviour and its associated thinking. You may be able to do this yourself or need help from an appropriate person, such as a colleague, friend or maybe a counsellor. Take account of the sort of person are you, of your values and your expectations. Access whether these ‘fit’ with the way in which you are trying to tackle the task. Do you need a new approach with which you will be more comfortable with? Identify goals and make realistic decisions about how to do the tasks, and prioritise. Break down your tasks into manageable tasks. If you there is a deeper issue to why you procrastinate and you wish to gain a clearer understanding of the personal and emotional reasons to why you procrastinate, you may wish to gain further help. A counsellor can help you examine these aspects and give you a clearer understanding to how they hinder you doing a task. Just remember, don’t leave it too long! How am I tackling my avoidance of my BACP accreditation process? Rather than set myself a deadline to when I wish to complete the whole process, I have set myself targets for each individual section that need to be completed. I ensure that each month I spend some time with my supervisor reviewing the work I have carried out to date. Chatting with other counsellors who are also involved in the BACP accreditation process to keep my motivation and interest. Do you procrastinate? Do you have any useful tips to how to stop procrastinating? This entry was posted in procrasinate and tagged procrasinate on November 30, 2013 by Hazel Hill.